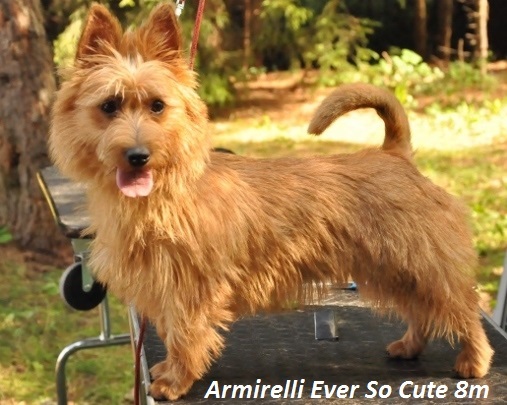 Armirelli Ever So Cute "Tralla" BOB Junior, Jun CAC, ESTJCH, BOB, Best In Show Junior! Johnny parim isane, Tralla parim emane, Eesti juunior tðempion ja selle näituse BIS Junior! Tubli debüüdi tegid Rufus ja Rita - igati tubli esitus ja Rufus sai kohtunikult väga lubava kirjelduse. Great thank you to judge Yolanda Magler Magal! Great thank you to Anne Nuutinen - Mäntula fot help in BOB-ring! Lot of thanks to co-owners Kristiina and Anne/Marietta! 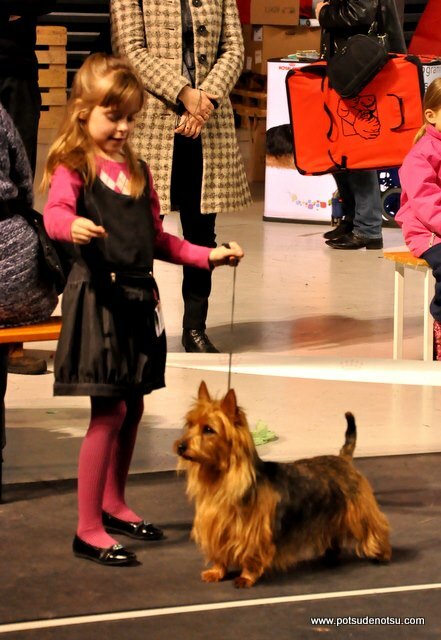 Kristiina and Missy ( Truozzy`s Hand In Hand ) in Child and Dog competition gained place 2! Well done you both! 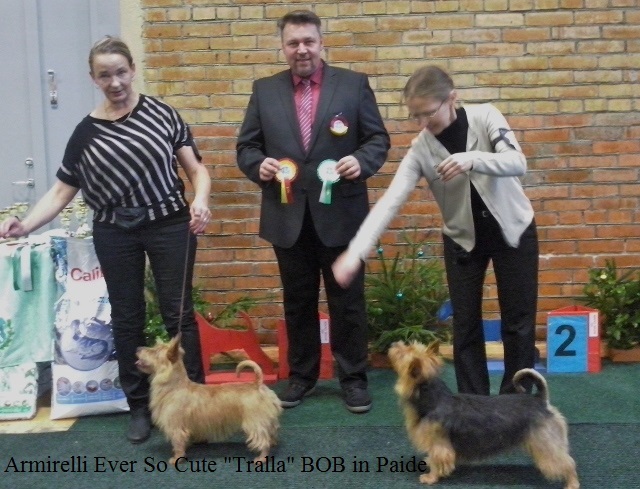 Armirelli Ever So Cute " Tralla" at age 9 month JCAC and BOB Junior under judge Kresten Scheel from Denmark. 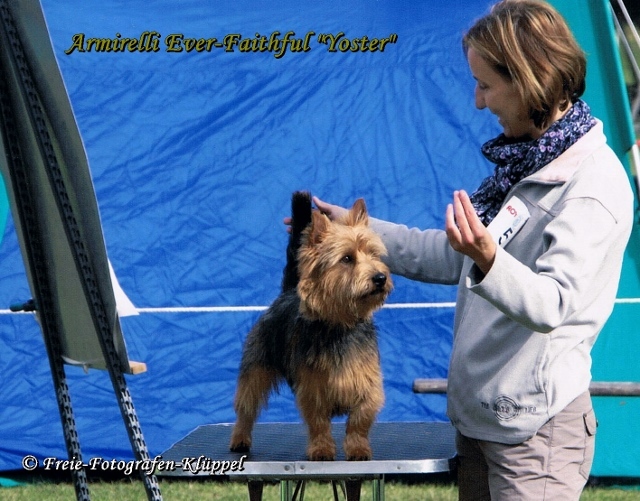 Yoster ( Armirelli Ever-Faithful ) at age 9 month "Bundesjugendsieger" and BOB Junior! Congrats again and thank you, Sandra! Nädalavahetusel oli Saksamaal Dortmundis aasta suurim tiitlinäitus "Bundessieger 2013", kus meie Ever-pesakonna isa Sydney oli parim veteran ja Yoster ( Armirelli Ever-Faithful) parim juunior, saades oma esimese juuniorsertifikaadi ja juuniorvõitja tiitli "Bundesjugendsieger"! Suurepärane! Tänud ja palju õnne Sandrale! 06.10.13. Armirelli Evergreen Lady, BOB, BP and RBPIS at Liverpool Terrier Club. 21.-22.09.13 great weekend in Latvia and UK! 21.09. 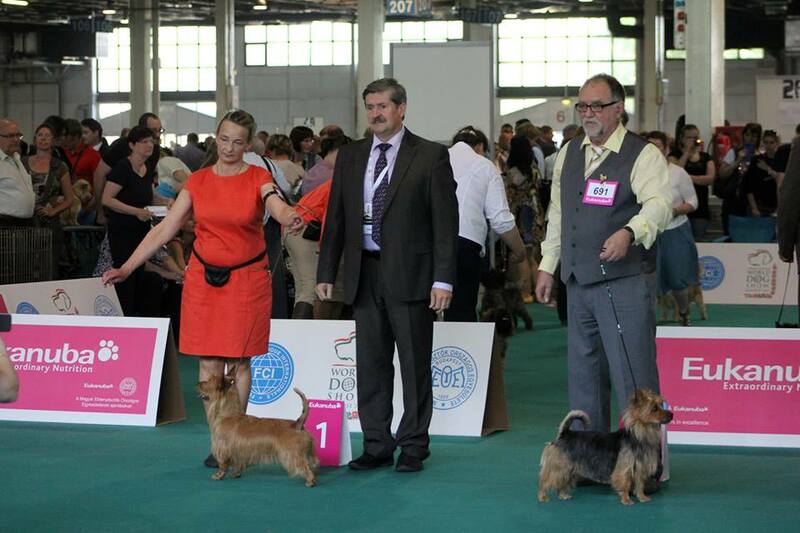 Terrier Speciality show in Riga, Latvia: Armirelli Code Red " RU" BOB and Club Winner, Armirelli Double Scotch "Johnny" BOS, CAC, Club Winner, Armirelli ever So Cute "Tralla" BOB-puppy and BIS 4 under judge Johanna Szczepanska-Korpetta ( Poland). Thank you to the judge and my co-owners! 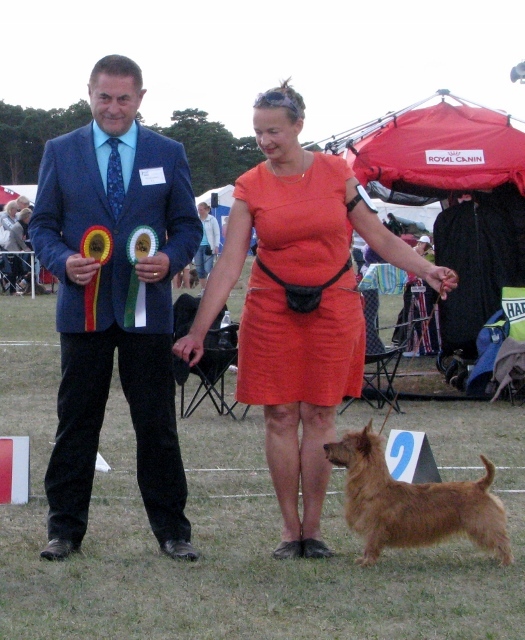 Armirelli Evergreen Lady "Lady"won her class today at Driffield Championship Show and went on to Best Puppy In Breed. Armirelli Secret Code "Cody" and her puppies Amberush Walkin On Sunshine and Amberush Quick As A Flash all won their classes too. 22.09. 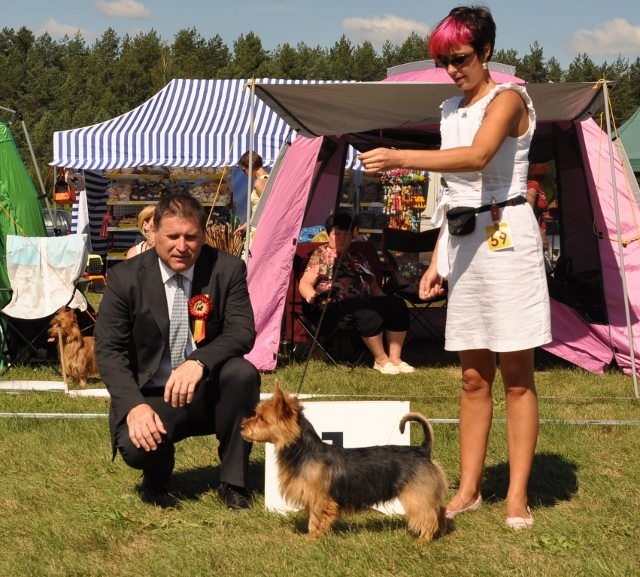 Terrier Show in Yarm . 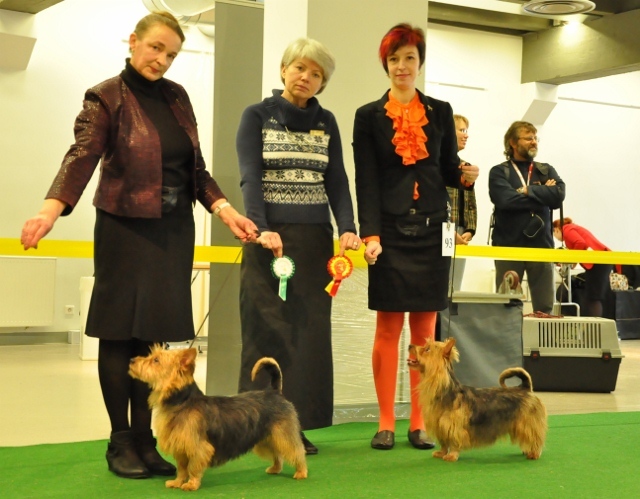 Three classes for Australian Terriers. Lady won hers, Flash was first with Walker placed second this time, and Cody won hers. Then Mr Walshaw looked after little Lady, and she was BOB and BPIB!! Congratulations to Rachel and her team! Armirelli Ever-Faithful "Yoster" BOB Puppy judged by Mrs. Letakova, CZ: 8 month old male; already well developed, excellent head, dark eyes, very well set and carried ears, well set neck, good shoulders, very solid and straight back, correct tail, good in front, excellent rear angulation, free movement, very good coat. Thank you to the judge and owner/handler Sandra! 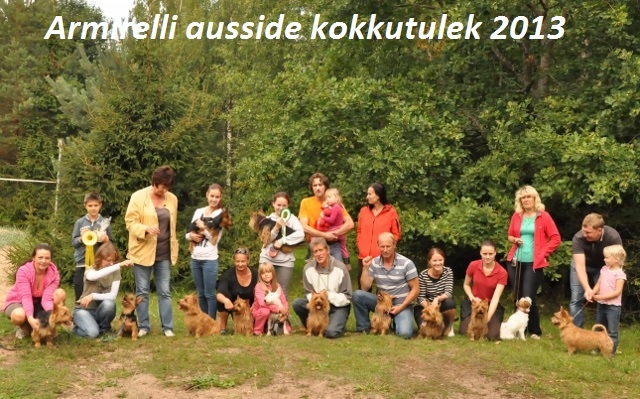 31.08.13 Armirelli Ausside kokkutulek Tsitres. 13 aussit + 2 külaliskoera ja rohkesti rahvast oli kohale tulnud. Tänud kõigile osalejatele ja korraldajatele. 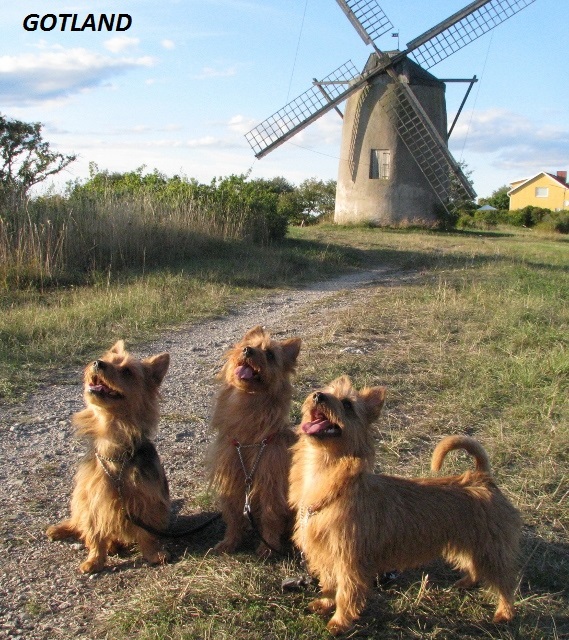 24.-25.08.13 Great weekend for our dogs in Gotland and UK! 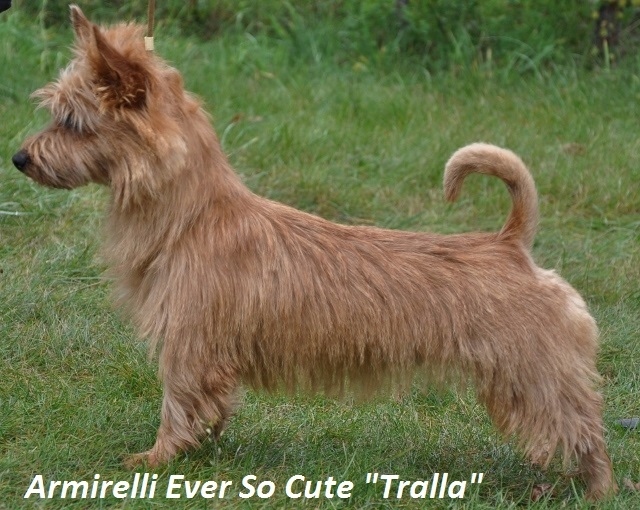 Armirelli Ever So Cute " Tralla " Best Puppy both days! 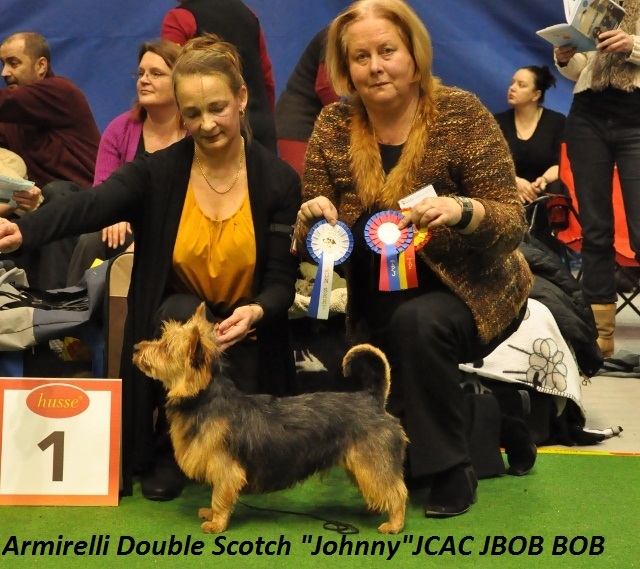 Armirelli Double Scotch " Johnny" Junior and intermediate cl winner, Best Male3. 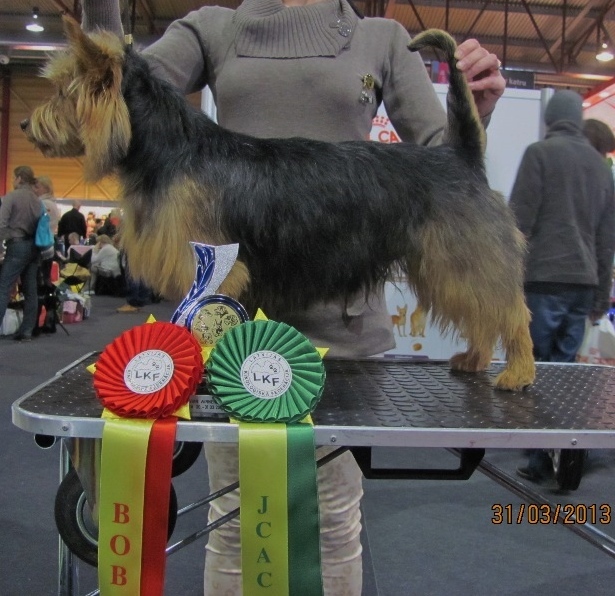 Armirelli Code Red " RU " CAC X 2, CACIB X 2, BOB, BOS, Swedish Champion! Thank you to judges Rita Reyniers and Michael Leonard! Also great thanks to co-owners Anne / Marietta and Kristiina! 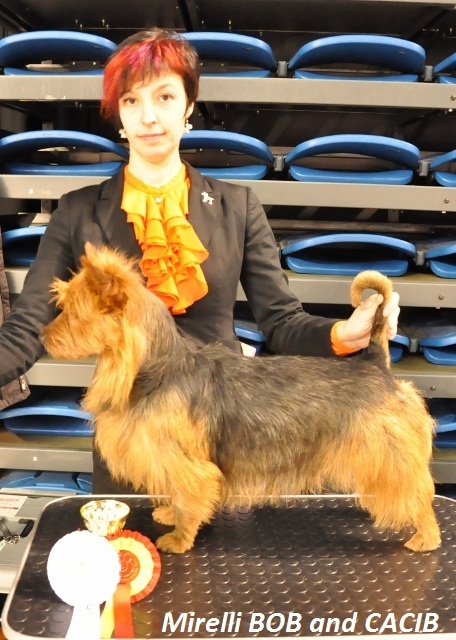 Sunday in UK: Lady (Armirelli Evergreen Lady) won her puppy class. Cody (Armirelli Secret Code) won the open class. 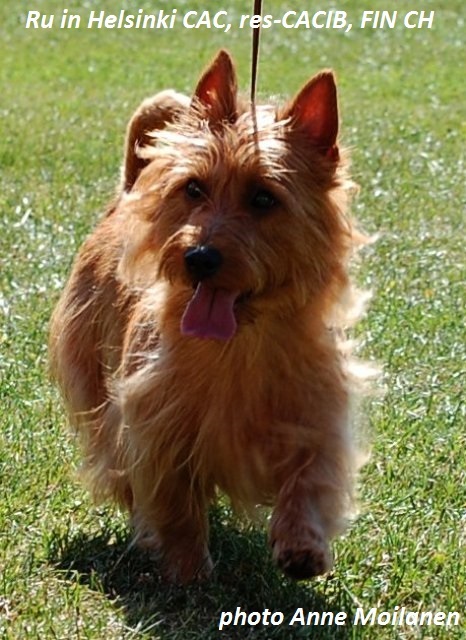 Cody was BOB, and went on to be placed fourth in the Terrier Group. Johnny ( Armirelli Double Scotch) Best Male 2. 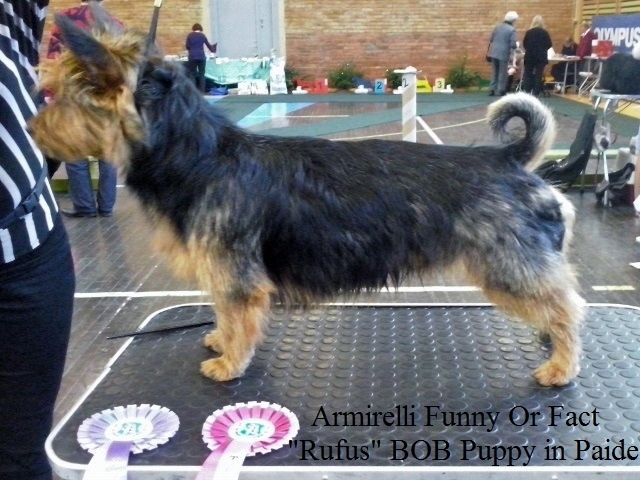 Ru ( Armirelli Code Red) BOB CACIB C.I.B. Great thank you to the judge and to co-owners! 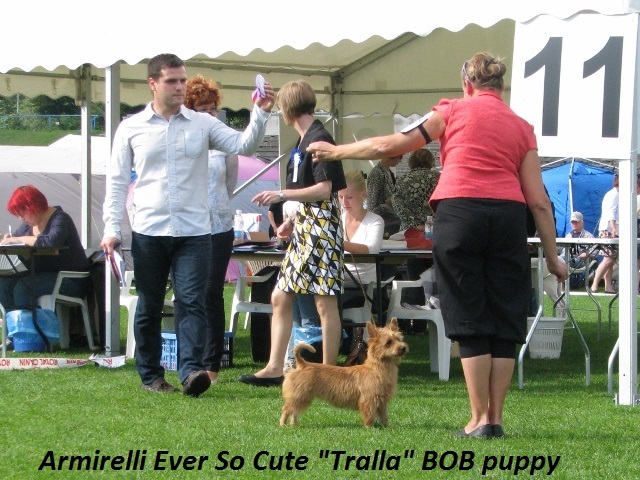 Armirelli Ever So Cute "Tralla" first shows abroad at age 6 months: boths days the Best Puppy. She did well and had lot of fun in the heat over 30 degrees. 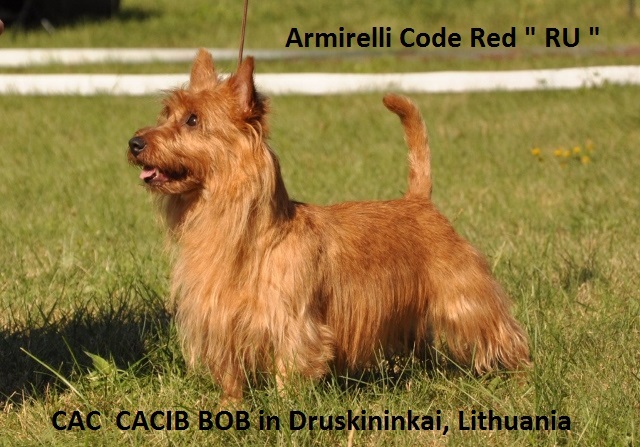 Armirelli Code Red " RU " CAC, res-CACIB and Finnish Champion. 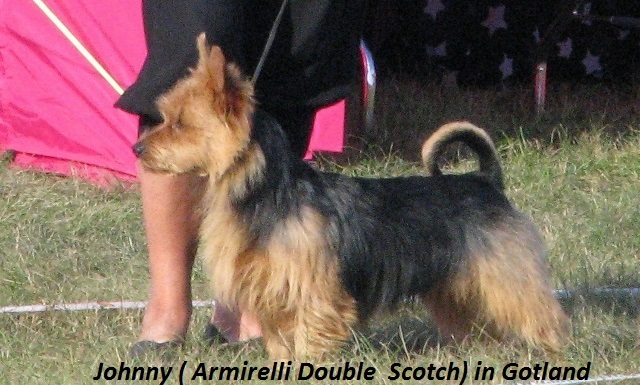 Armirelli Double Scotch " Johnny" excellent and 1. placement in intermediate class under Frank Kane ( UK ). Thank you to the judge and the owners. Johnny ja Ru tublid tulemused Soome rahvusveheliselt näituselt! Ru on nüüd Soome tðempion! Tänud kohtunikule ja omanikele!!! 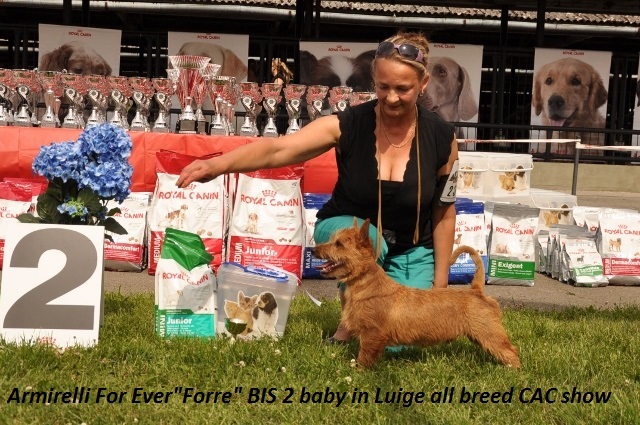 Armirelli For Ever "Forre" BOB Baby and BIS 2 Baby-puppy in all breed CAC Show. Armirelli Double Scotch "Johnny" Jun2. 17.05. 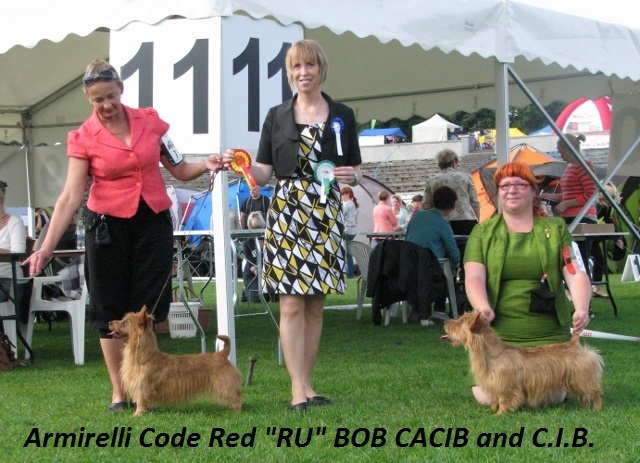 Interra Winner: Armirelli Code Red "RU" CAC, BOB, Interra Winner! 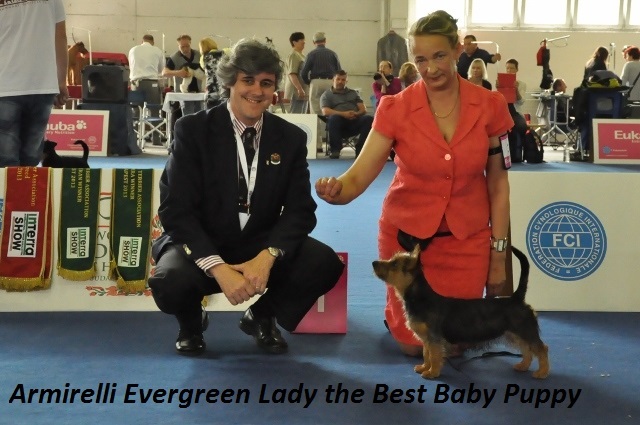 Armirelli Evergreen Lady - Best Baby Puppy, BIS 4 baby. 20.04.13. Armirelli About Trust "Ruudy" with Glen in AG1 II place. 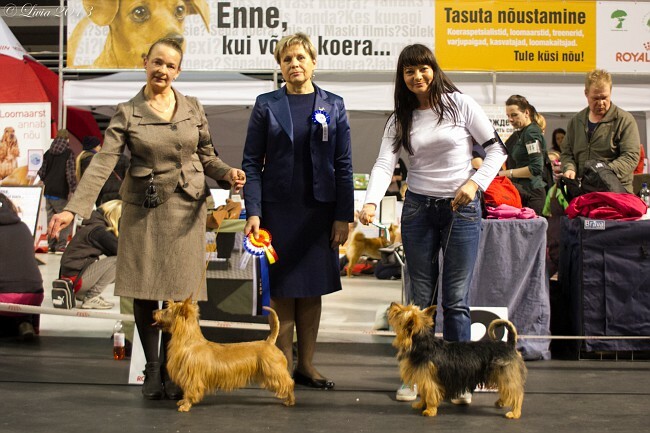 Tallinn Winner Show results: Armirelli Code Red "RU" BOB, TlnW13, CAC, CACIB, EST CH! Also LVCH, LTCH, BALT CH waiting for conformation. 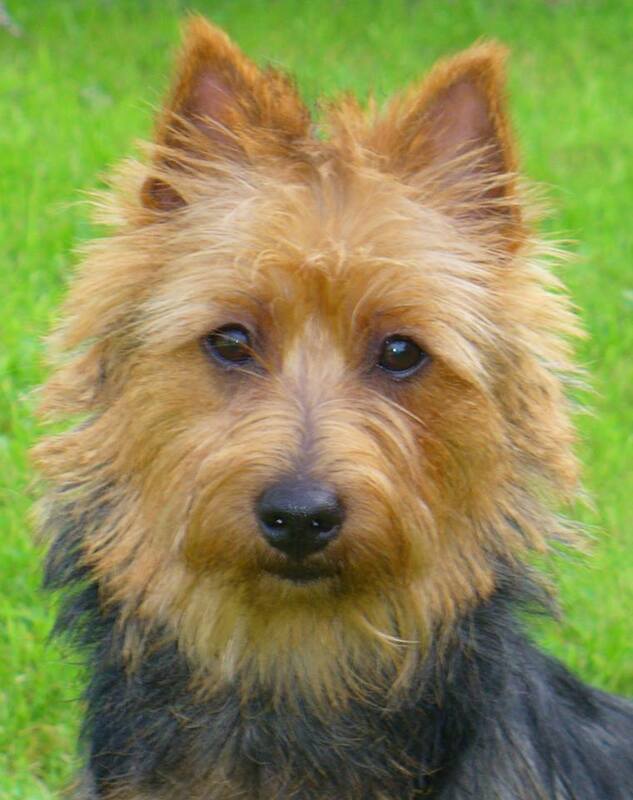 Armirelli Double Scotch "Johnny" BOS, TlnJW13, TlnW13, Jun CAC, ESTJCH! Thank you to judge Jurate Butkiene, to my co-owners Marietta/ Anne and Kristiina and to Livia for photos! Ru ja Johnny kenad võidud "TALLINNA VÕITJA 13" näitusel: Ru tõu parim, Johnny vastassugupoole parim. Johnny sai kätte 3nda juuniorsertifikaadi ja on nüüd Eesti juunior tðempion. Ru sai serdi 3 kuud peale kutsikate sündi, näitas üles suurt rõõmu olla tagasi ringis ja ootab nüüd mitmete riikide tðempiontiitli kinnitamist. Tänud tublidele kaasomanikele!!! 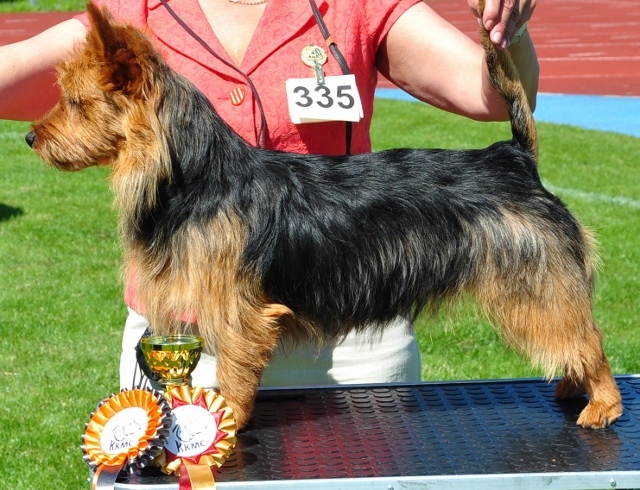 04.04.2013 GREAT INFO: Truozzy`s Hand In Hand "Missy" TOP TERRIER 2012! 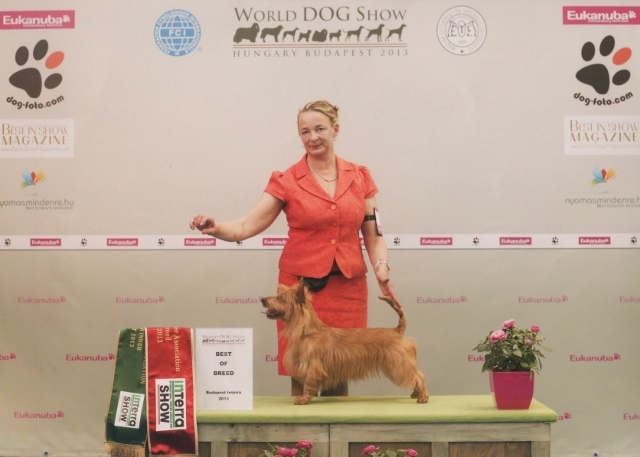 Great thank you and hugs to Breeder Anne Moilanen to Finland! Eesti Terjeriühingu "Aasta Terjer 2012" konkursile esitatud näitusetulemuste alusel valiti aasta terjerid. Olen üllatunud ja tohutult rõõmus, et 2 minu poolt esitatud aussit pälvisid esikohad. Tänud Kasvatajatele!!! 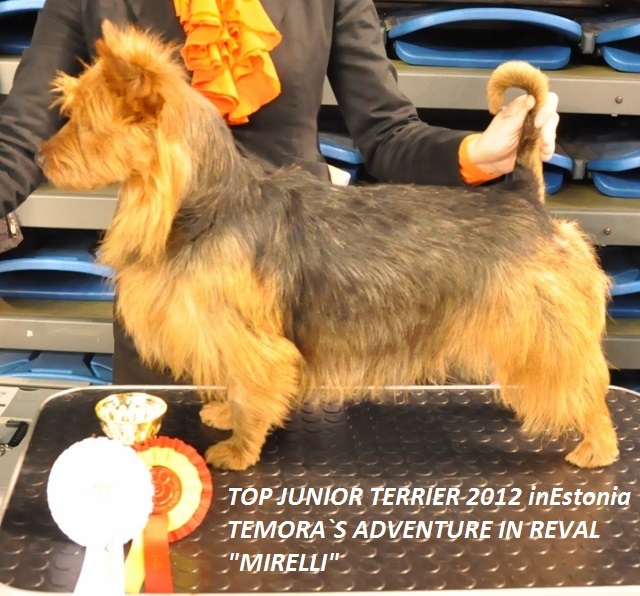 Temora`s Adventure In Reval TOP JUNIOR TERRIER 2012! Great thank you to Breeder Julie Seaton to USA! 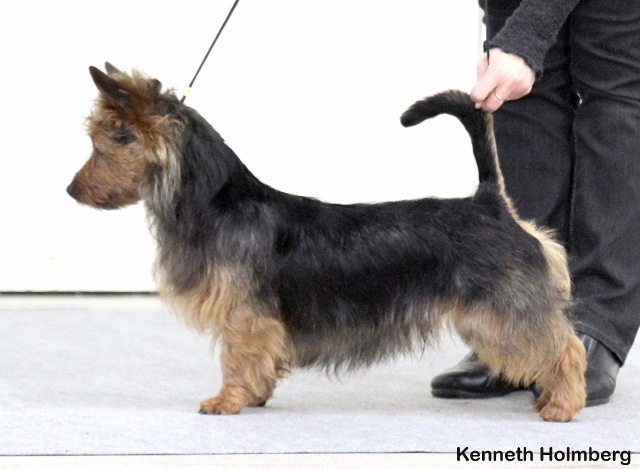 Armirelli Double Scotch "Johnny" won JCAC, LVJW13, and Best Of Breed over open and champion class dogs at age 11 months. Really proud of this! Thank you to Margot for handling and Anne for helping with final grooming. Johnny tegi suurepärase tulemuse "Läti Võitja 13" näitusel Riias: Läti Juuniorvõitja, Läti Juuniorsert ja Tõu Parim, võisteldes ava- ja tðempionklassi koertega 11 kuu vanusena. Olen tõesti ta üle rõõmus! 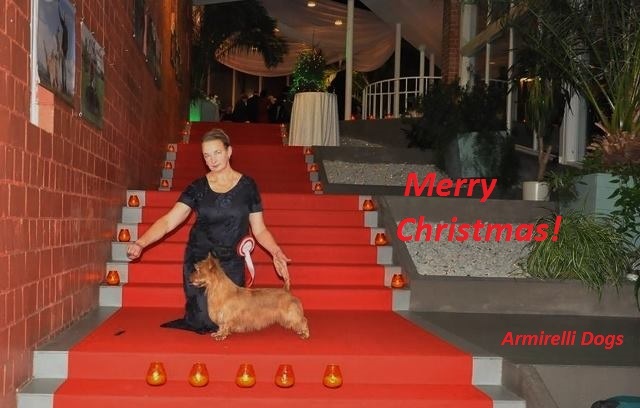 Tänan Margotit esitlemise eest ja Annet abi eest koera lõplikul viimistlemisel, kuna kahjuks ei saanud ise asjas osaleda! Samuti tänud kaasomanik Kristiinale tõhusa koostöö eest! 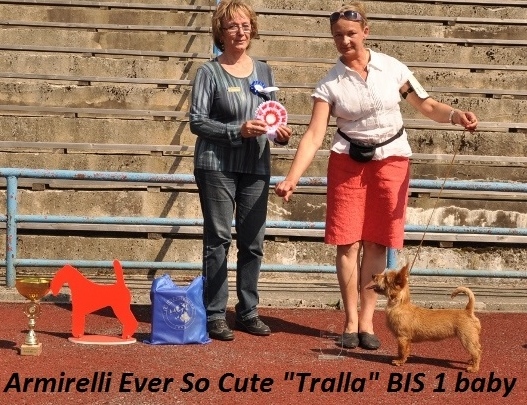 Esty ( Armirelli About Truth) and Maria won A1 agility competition, it was the first competition in this class. Congrats and thank you to Maria!!! Maria ja Esty võitside esmakordselt A1 klssis võisteledes hüpperaja, suurepärane tulemus, tänud Mariale ja treener Tiinale!!! Yoster moved to Germany to his father with new owner Sandra Weinhold. Have a wonderful life together! Yoster lendas nädalavahetusel Saksamaale oma isa juurde elama. Soovin neile kaunist tulevikku! 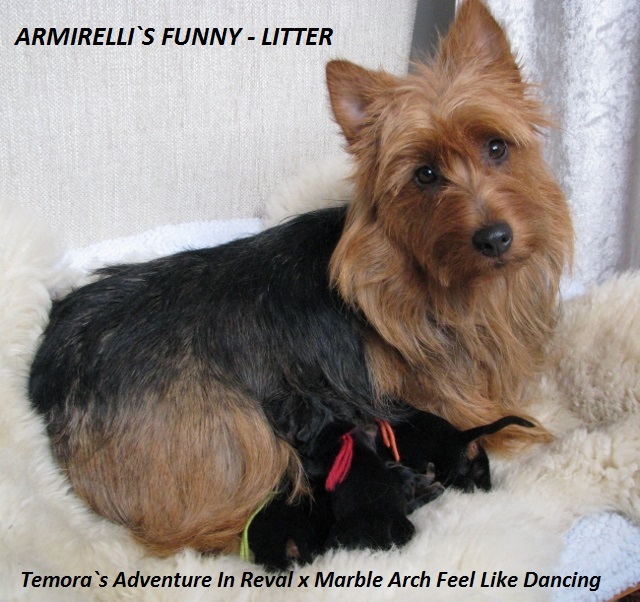 Temora`s Adventure In Reval "Mirelli" X Marble Arch Feel Like Dancing " Tico"
Temora`s Adventure In Reval " Mirelli" BOB and CACIB under judge Tino Pehar handlered by Margot Oder. 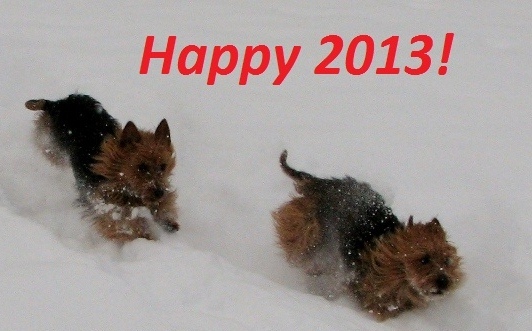 Thank you to both and to Mirelli`s breeder Julie! Mirelli sai oma esimese CACIB`i Tallinna rahvusvahelisel näitusel. Olude sunnil näitas teda Margot ja tänud talle! 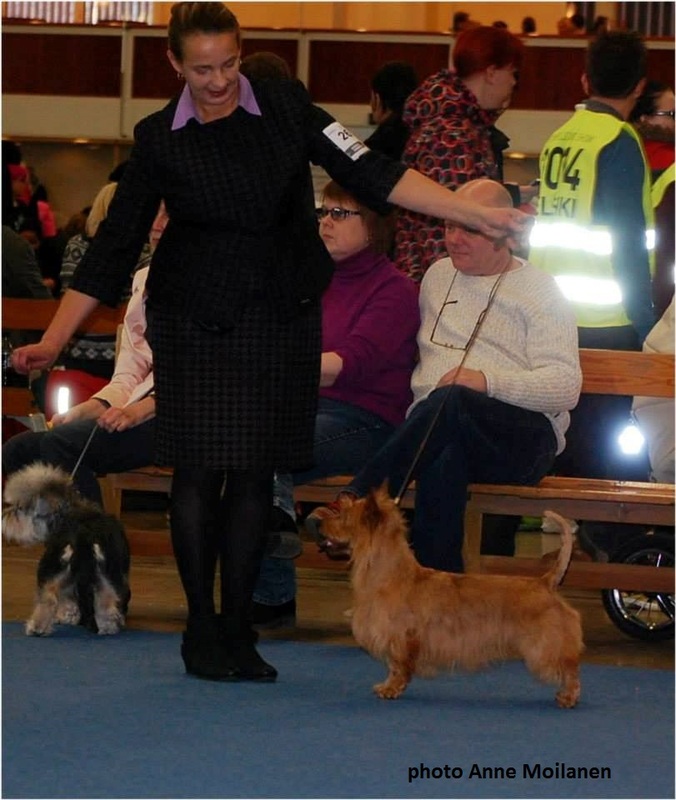 Miisu and Missy debuted in Child and Dog competition. 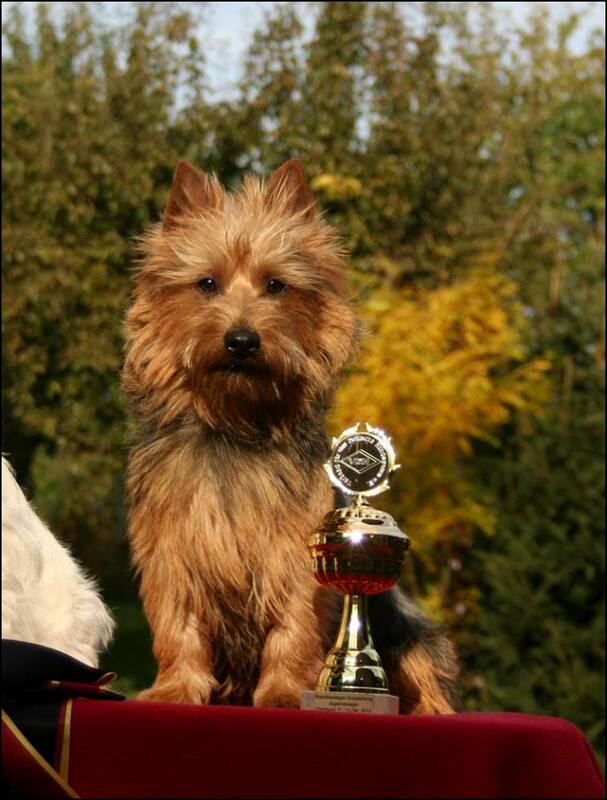 Armirelli About Truth "Esty" BOB, her son Armirelli Double Scotch "Johnny" BOO, Best Junior, BIS Junior 4 and was awarded title of " Best Junior Terrier Born In Estonia". I am really happy! 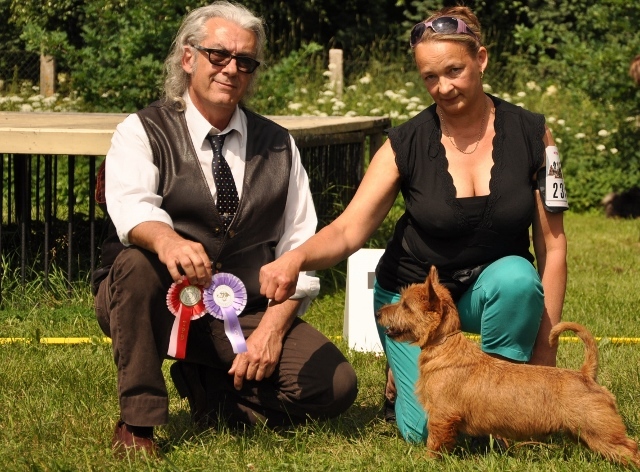 Thank you to judges Maret Kärdi and Csaba Zolt Locodi. Great thank you to owners/co-owners Maria and Kristiina. Esty ja Johnny olid terjerite erinäitusel edukad, ema tõu parim ja Johnny vastassugupoole parim, samuti parim juunior. Kõikide tõugude juuniorite hulgas valiti Johnny neljandale auhinnalisele kohale. Kuna 1.-3. koha hõivasid välismaa koerad, siis tituleeriti Johnny parimaks Eestis sündinud juunior terjeriks! Olen selle üle tõeliselt rõõmus!!! 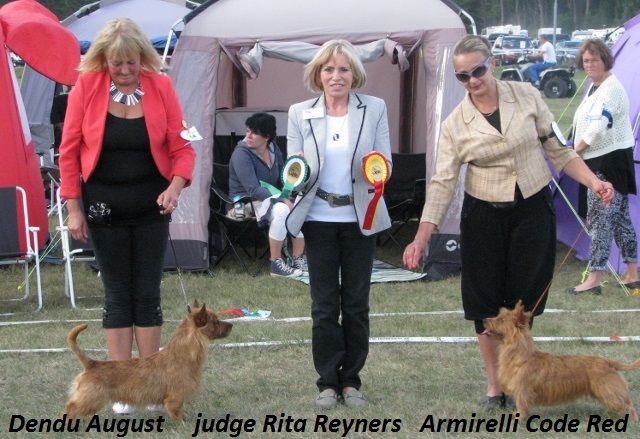 Armirelli Double Scotch "Johnny" at age 9 months JCAC, Best Junior and BOB under judge Anne Klaas. Thank you to judge and Johnny`s co-owner Kristiina. Johnny sai oma esimese juuniorsertifikaadi Narva näitusel, oli parim juunior ja tõu parim austraalia terjer. Tänan kohtunik Anne Klaasi suurepärase kirjelduse eest. Tänud kaasomanik Kristiinale! 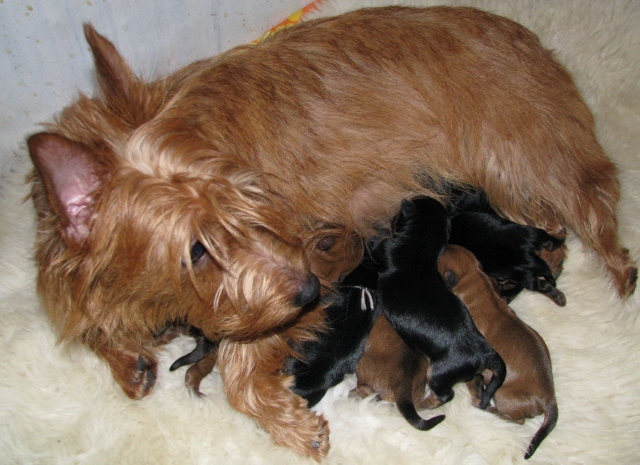 We have puppies born 07.01.13 Meil on Kutsikad!